Website: Be sure to review the site for park rules and additional informaiton. From Dallas (2 hours): take I-20 east to Marshall, TX, and get on Hwy. 59 North. Go through town to HWY. 43 North; take 43 North. In ten minutes or so, you will come up on 449 spur. Take a right on 449 (also a post office sign on Hwy. 43). 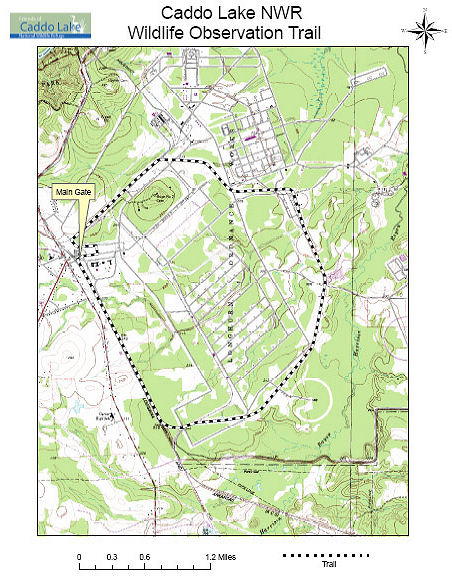 Follow this for about 2 or 3 miles, and you will come to the intersection of 43 and Hwy. 134. There will be a post office on the opposite right corner and the Karnack Community Center on the opposite left corner. Go straight through the intersection and over the train tracks, and you will enter the refuge. From Shreveport (1/2 to 3/4 hour) – Take I-20 West to Waskom, TX. At David Beard’s Catfish Restaurant, take Hwy. 134 North out of Waskom. Follow Hwy. 134 into Karnack. In Karnack, you will come to the intersection of Hwy. 134 and 43 (T.J. Taylor Avenue). Take a right past the post office and cross the train tracks, and you will enter the refuge. Camping:There is no overnight camping. Hours: Open from sun up to sun down. Cost: An annual fee of $20 for a membership allowing access to the trails. A member can have up to 6 guests. Arrangements must be made prior to coming out. 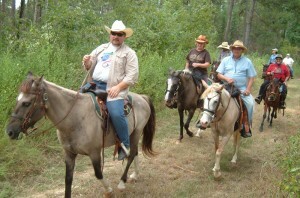 If you are a member you can come out and ride but guests should have coggins sent in ahead of time. If you are going to ride in any type of group they also want to know ahead of time. Cell Phone Coverage: There is cell reception through most of the trail. Hunting: There are times for scheduled hunts for wildlife management. Facilities: At the trailhead is a nice large parking area with a new bathroom facility. There is running water with a hose, but you need to bring your own bucket. The bathroom is the only facility in the horse area. There is also a visitors center and some picnic areas on the property. There is currently one picnic table on the trail and I am certain others will be coming. There are no hitching posts or pens, so you have to tie your horse to the trailer. There is no water on the trail at this time. Mileage: Currently there are aproximately 10 miles of trails. Terrain: The trails are flat with some rock from the rails to trails and the trail also crosses some roadways. 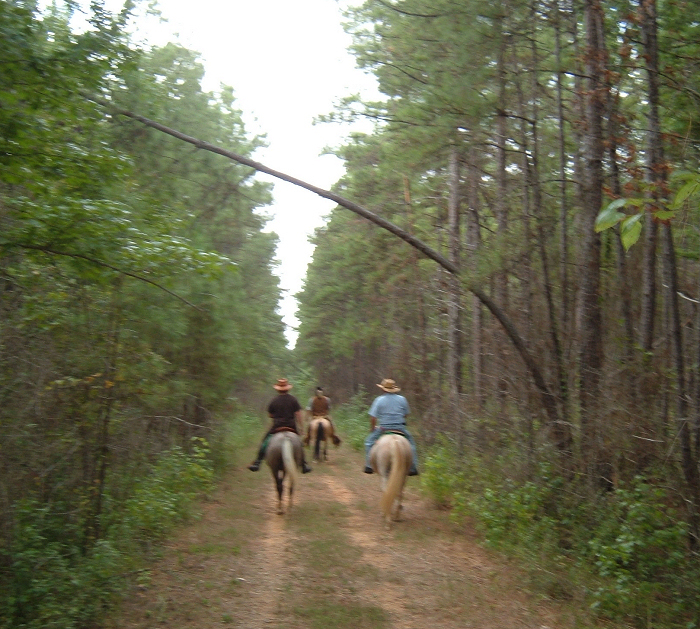 The trail winds through the East Texas piney woods and is fairly flat. Most trails are reclaimed rails to trails. There are manmade structures that are being removed. An old rail road tressel has been boarded over to make a bridge that is on the trail.The bridge is about 20-30 feet long and no more than perhaps 10 feet at its deepest. It was approximately 8 feet wide and completely boarded. They have added a rope along both sides. The first time we crossed, several horses were leary of the bridge. 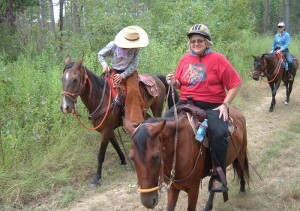 As I was leading and made my horse, Diana cross, the others horses followed tentativly accross. One rider opted to lead accross. 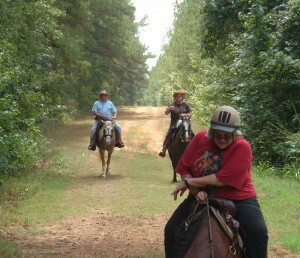 On our second visit most horses were not bothered at all and crossed the bridge willingly.The trails are broad and can be ridden quickly or as leasurly as you like. The trails are marked for hiking, riding, bird and wildlife watching. This is a very nice area and is being improved. KARNACK, TX August 2012 — Sing in the Sunshine, Farewell Angelina, Thunder Heart, My Wonder Woman, Dakota Wind Dancer, Boots, Outlaw and Smoky are not folkloric fairytale characters, but they are the names of a unique breed of horses with a rich heritage who all reveled in a day of trail riding Saturday at Caddo Lake National Wildlife Refuge. “All are special, but all are different,” Dorene Gabel, one of the horseback riders, said of the group of Indian horses, consisting of Colonial Spanish Mustangs and Bureau of Land Management feral horses. The riders — who hail from Longview, Marshall and LaRue — recently organized NETASA, a horse club based in the Tyler area under the parent registry, the American Indian Horse Registry. George said the Colonial Spanish Mustangs are rare; less than 5,000 are registered now. George, the proud owner of Spanish Mustang, “My Wonder Woman,” whom he has nicknamed “Diana,” can’t agree more. “They’re still here; we’re still riding them and we’re still enjoying them,” said George. The nine-mile equestrian trail is open for riding year round and encircles the refuge. The trail was originally a railroad trestle used to transport ammunition from what was once the Longhorn Ammunition Plant. Water for both horse and human consumption is available at the parking lot of the refuge. “This used to be the main parking lot for employees when they were making bombs,” said Stephenson. Stephenson said the trail, which is maintained and mowed, has two unique qualities. “It does (lead) you out in the woods in an area you can’t go in a vehicle. You can stop and walk, do bird watching,” he said, adding it’s not just for horse riding. Plus, it’s one of the few places in East Texas to ride horses during deer hunting season because there isn’t any deer hunting there in the fall. “Most places, there’s deer hunting,” said Stephenson. “People are always looking for places to ride.” He said the trail allows three designated days for riding. “This gives you an opportunity to ride during deer season,” he said. The fall and spring seasons are when the bulk of activity hits the trail, said Stephenson. Stephenson, who has been riding horses since about age 10 and tries to ride about once a week, said riders travel quite a distance to ride a trail. 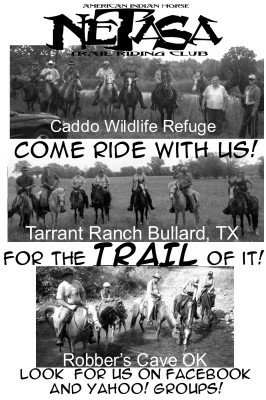 For more information on the wildlife observation and equestrian trail, visit the Friends of Caddo Lake National Wildlife Refuge’s website, www.caddofriends.org.